Hooke was born on the Isle of Wight, England, on July 18, 1635. Confined to his home by illness, he kept busy by making a variety of mechanical toys. He was tutored by his father, a poor cleric. Orphaned at age 13, Hooke moved to London where he worked as an artist’s apprentice until he saved enough for tuition to Westminster College and later to Oxford University. In 1655 he helped chemist ROBERT BOYLE, one of his professors at Oxford, devise an improved air pump. Using the pump to create a vacuum in a jar, Hooke demonstrated that a feather and a coin released simultaneously from the top of the jar fall at the same speed in the absence of air. He also did original work on surface tension and capillary action. Hooke proceeded to London in 1660 and joined Boyle, ISAAC NEWTON, and others in founding the Royal Society of London for the Improvement of Natural Knowledge. As Curator of Experiments, Hooke was responsible for presenting a demonstration at each weekly meeting. Also in 1660, while investigating how materials respond to stress, Hooke formulated a law of elasticity stating that the amount of deformation of a material is directly proportional to the force (such as stretching, compressing, bending, and twisting) applied to it. Using this information, he designed a spring balance for controlling timepieces. However, CHRISTIAAN HUYGENS was the first to incorporate the device into a working model. Hooke’s Micrographia appeared in 1665; it contained observations made under his newly invented compound microscope, including detailed drawings of many living things, structures invisible to the naked eye. He described arrays of tiny compartments in a sliver of cork and named them cells from the Latin for “small chambers.” That same year, he was appointed Professor of Geometry at Gresham College and remained there for the rest of his life. He built a reflecting telescope, made numerous astronomical discoveries, and improved the pendulum clock and the barometer. He analyzed the nature of combustion and formulated theories of light diffraction and planetary motion. He devised several instruments to record weather conditions and methods to systemize that data. By 1678 Hooke had developed a qualitative idea of gravitational force, but he failed to add a rigorous mathematical description; this task was left to Newton, who published his theory of gravity in 1687. 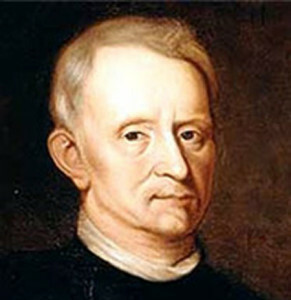 Hooke thereafter engaged in bitter quarrels with Newton, claiming credit for his theory of gravity. Hooke died in London on March 3, 1703. Hooke’s innovative experiments and various theories were influential across a wide range of disciplines. His ideas often preceded those of others who developed his ideas more thoroughly and obtained full credit. Hooke’s first scientific endeavor, the construction of an air pump, led to Boyle’s investigations of the properties of air. Boyle used the pump to demonstrate the role of air in combustion, respiration, and sound transmission. His examination of other gases resulted in the formulation of Boyle’s Law, which states the mathematical relationship between the pressure and volume of gases. Hooke’s work with springs and pendulums contributed to the technology of timepieces. His efforts, combined with those of Huygens, produced clocks that could tell time to the nearest minute. In 1722 astronomer EDMOND HALLEY acquired an advanced telescope constructed by Hooke and with it made daily observations of the moon for 18 and a half years. The data enabled him to create accurate lunar tables, useful for calculating longitudes on the open sea. Hooke’s observation of plant cells proved to be far ahead of the understanding of microscopic biology. In 1839, nearly two centuries later, the pioneering work of Matthias Schleiden and Theodor Schwann showed cells to be the building blocks of all life. Hooke founded the study of the effects of stresses and strains on elastic materials, which has been fundamental to the development of architectural design and various engineering fields. He also played a key role in making a professional body of the Royal Society; which remain, the primary forum for the exchange and encouragement of scientific ideas and experimentation in England.